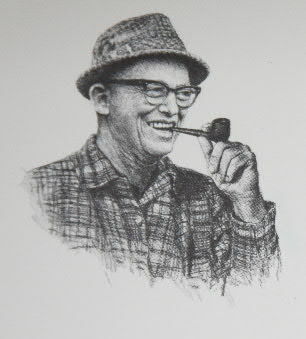 Charlie Elliott, friend, mentor, writer, conservationist and turkey hunter. 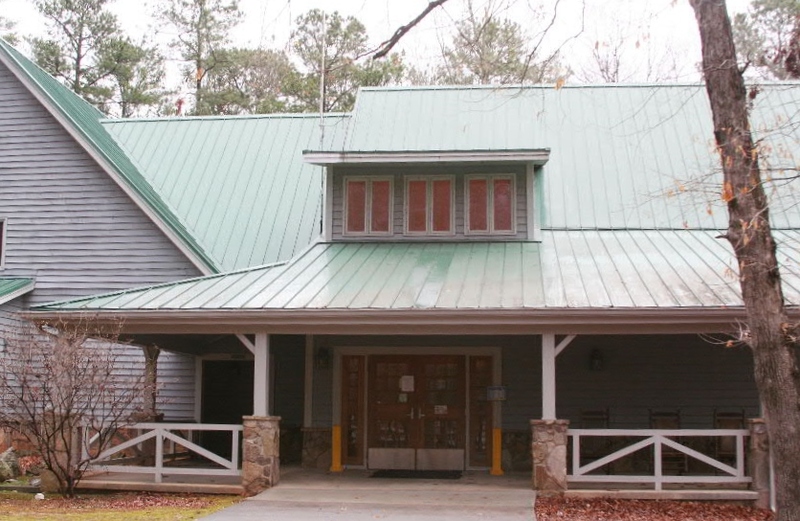 I will give the second annual How to Become an Outdoor Communicator Seminar at the Charlie Elliott Wildlife Center near Mansfield, Georgia, on March 7, 2015. The even will start at 9:00 AM and formal presentations will conclude at 4:00 PM followed by a question-answer and networking period until 6:00 PM. Among the topics to be covered are newspaper, magazine and book writing-publication; radio broadcasting and PodCast radio; Video and TV production; Social Media, including Twitter, blogging, Pinterest and Facebook; and Lecturing and Performing Stand-Up Comedy. The objective of the Seminar is to demonstrate how outdoor communicators should employ several methods to disseminate information to the widest possible audience. My intellectual burden is that I have never been satisfied to work in only one media – say newspaper journalism, although that is how I started. I have progressed through all of the things that I have mentioned and produced thousands of news and magazine articles, 18 books, 1.5-years of radio, 400 YouTube videos, commonly posted on Social Media platforms, and delivered numerous lectures and comedy bits for social and industry audiences. The modern consumer audience has become increasingly segmented. Younger media users tend to rely on one or two media types for 70 or more percent of their daily informational intake. To ignore YouTube videos is to block out what is becoming the most commonly used search engine. Any creator of outdoor content needs to be on that platform while not neglecting traditional print media which is still a significant part of modern communications. It has never been easier to take a picture, but it is as hard as it ever was to take a good picture. It has never been easier to publish a book, or more difficult to sell one. The flood of media being unleashed is enormous and somehow, the important information that you release must rise above the rest. The first objective is always to produce compelling content. The second is to morph this content into several platforms so that it gains a higher ranking on search engines, reaches a larger audience and provides you with increased opportunities to deliver your message or service. I do this quite commonly, and I may cover aspects of the same subject material in books, magazine articles, blogs, videos, radio and social media. In narrow topics, this quickly establishes me as the go-to guy for that information. Not only have I written, etc., about it; I have also done my field work and physically demonstrated the item or concept. Entertainment always has a part in my materials with some pieces being more outrageous than others. Always, I try to put in the unexpected or unusual in what otherwise might be a fairly dry topic. A little performance art does not hurt. Life is full of follies, and I am not reluctant to talk, or write, about mine. Unusual for business-related seminars, I will be doing some demonstration wild-game cooking during our lunch break. Anyone who wishes may eat, but bring your own drinks or you may go to Mansfield, some 5-miles away and dine there. Regardless, the seminar will resume promptly at 1:00 PM. Many of last year’s attendees thought that this meal was the highlight of the event. Attendees will also be provided with a detailed workbook of the presentation which will be E-mailed to them prior to the Seminar. Please print out and complete the first sections of it before attending. Do your homework. I will only have a few extra copies at the event for $10 each. The more time you are able to put into the workbook prior to the event, the more you will get out of it. There will be a $50 charge. This fee is to be paid to the Charlie Elliott Wildlife Center. The event will be held in the facilities’ Discovery Center and attendance is limited to 25 participants, so make your reservations early. Rooms are available at the Center, but these also need to be reserved. This facility is somewhat isolated, and is about 40 miles south-east of Atlanta’s Hartsfield Airport. The nearest motels are located on I-20, about 20-miles away. Reservations may be made for the Becoming An Outdoor Communicator Seminar by Wm. Hovey Smith on March 7 by calling (770) 784-3059 or E-mailing Amber.Mooney@dnr.state.ga.us. This knife was handled using a piece of butcher block maple that had been cut by a friend’s father more than a decade ago. Once handles were put on flint blades to make what we now consider a knife, mankind has had the desire to make knives that somehow related to the hunter’s past experiences by personalizing them. Custom features that he might put on the knife scales might be inscriptions, studs, imbedded objects or even scrimshawed scenes. 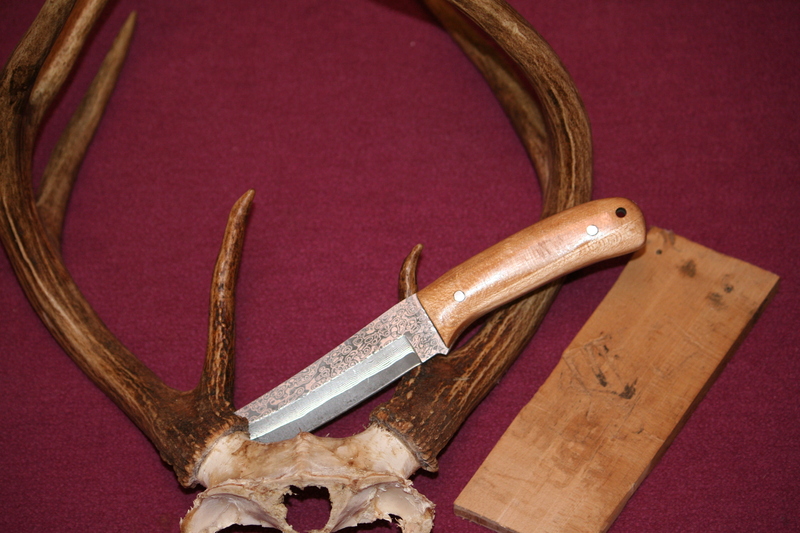 Or, a more direct approach might be to use a segment of a deer’s antler, hoof or leg bone to make the grips. Modern commercial makers continue this tradition by offering their knives with scales made of all of these materials as well as occasionally using wood from historic trees, buildings or ships to make limited-production knives. 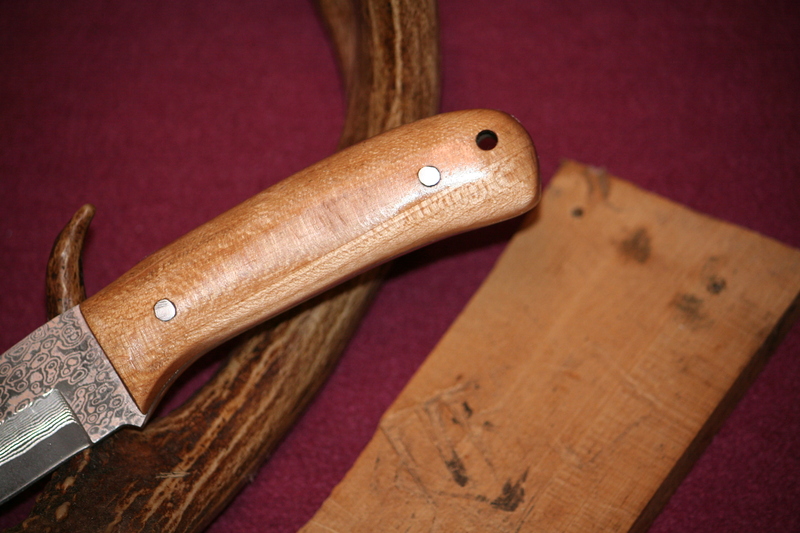 Wooden grips are particularly useful for making a story knife because the material is common, easily worked, and frequently used to make buildings, furniture and ships. Almost everyone has something made of wood that is of special significance. This might be a salvaged plank from an old home place, a segment of broken tool handle used by an ancestor or a piece of limb from an old cottonwood tree where the family gathered for lunch after a traditional opening-day pheasant hunt. Some woods make more attractive knife handles than others. The harder, denser woods like desert ironwood, maple, hickory, ash, locus and persimmon make excellent grips. Softer, less dense woods like chestnut, walnut, pecan, cherry and heart pine (fat lighter) will also finish up well. Even common pines might be used as well as less common materials like magnolia and tea olive, which you might want to stain before applying a final finish. Spalted woods, which have streaks of discolorations caused by a fungus, can make attractive patterns in even the plainest wood, but typically these grips are soft and need to be protected by a scratch-resistant polyurethane finish. The example shown was made for friend Bill Krantz who purchased a discounted Wood River knife kit from a Wood Crafter’s store, with the idea that he would someday put grips on it. One of Bill’s pins made of Tea Olive from a broken branch on my property. To contact Bill about pins or the availability of this wood E-mail http://www.bkrantz@earthlink.com. He turns pins, and as I had much more experience in knife making, he asked me to install the grips. He had several pieces of exotic woods that could work, but what he really to use a plank that his late father had cut from a segment of maple butcher block. Butcher block is a strong laminated material and, although of irregular shape and thickness, Bill’s plank had some interesting grain. The knife blade was a very interesting piece of Damascus steel in which three different Damascus patterns were incorporated, cut and welded to a grip segment of plain steel. Some Japanese and Swedish knife blades use a single laminated construction where there is a band of hard steel sandwiched between two layers of more flexible steel to make a knife that can be very sharp while still maintaining a degree of flexibility. The Chinese-made Wood River blade had a cutting edge, a wider band of steel, bands of horizontal narrowly-laminated Damascus steel which was wrapped in a swirl Damascus pattern. The blade was completely shaped, drilled and edged. All it needed was grips. After selecting the segment of the plank that I wanted to use, I smoothed one side with a belt sander. After cleaning the blade with alcohol, I used Shoe Goo (a strong flexible, waterproof adhesive for repairing shoe soles) to stick the two parts together, clamped them and allowed the glue to set for four hours. Using holes in the steel knife handle segment as a guide, I employed a drill press to precision place the holes in the plank. 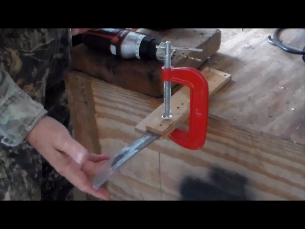 After clamping the bonded plank-blade in a vise, I used a skill saw to rough saw the outline of the first grip. The same method was used to glue the other scale, which was drilled with a hand-held drill using the existing holes in the grip and steel handle as guides. The longest part of the process at this stage was allowing time for the glue to set. 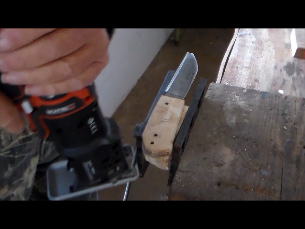 The start of the handling process with the blade being champed to the maple plank prior to drilling holes for the pins. To keep from being cut or stabbed, the protective plastic sheath is left on the exposed blade. Rough cutting the grips to shape with a skill saw. Now that the holes were drilled through the grips, pins were driven in and at this stage it would be best to use the skill saw to cut the two grip segments to as near the same profile as possible. A six inch grinder was used to rough-shape the wooden grips and take them down to the metal. For the first time, the maple plank started to look much more like a knife handle rather than two slabs of wood. Taking advantage of both the curved end of the belt sander and the flat segments, the grips were thinned to about the same thickness, and shaped to their final form by grinding the wood and metal together on the sanding belt. I have a video of the first stages of the handling process at: http://youtu.be/7NhmpCLoHCI. Another advantage of making a custom grip is that it can be made to actually fit the user’s hand. I mailed the knife back to Bill to see how it fit. He replied that the “beak” on the end of the handle pinched his hand and he wanted some of that removed. This was quickly done in a few minutes on the belt sander. 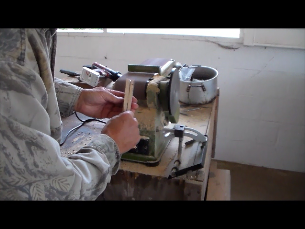 The knife was now ready for final handing sanding with 200 grit sand paper, 400 grit emery paper and 000 steel wool. Ultimately, I put four coats of Min-Wax traditional maple finish on the grips and polished them lightly with steel wood between coats. The result was a nice looking set of grips that fit Bill’s hand, had a custom thumb-indenture at the back of the blade for easy indexing and used a piece of wood that had special significance to him. This process was done in stages over a several-week period, but the total work time was probably on the order of 4-5 hours, not counting the time for the glue to dry. Building speed could be shortened by using a faster setting super glue and using more uniformly shaped wooden planks as scales. You can see a video of the final finishing steps at: http://youtu.be/7NhmpCLoHCI. Belt sanding was the second of two grinding-mechanical sanding stages. shaped blade blanks in a large variety of styles. With grinding and tempering a person could make his own blade, but using a pre-made blade is a more expedient way to make Story, Legacy or Heritage knifes for Christmas giving or personal use. Dixie Gun Works of Union City, Tennessee, also has a catalogue which features knife making as well as black-powder guns, historic accessories, antique gun parts, reference materials and considerable historic information for $5.00. Anyone who is interested in any aspects of historic Americana will find this to be a very useful book. You can order the catalogue by telephone at: 1-800-238-6785. I have not done my knife book yet, but I do have chapters on knives in Backyard Deer Hunting: Converting deer to dinner for pennies per pound and in X-Treme Muzzleloading: Fur, fowl and dangerous game with muzzleloading rifles, pistols and smoothbores. 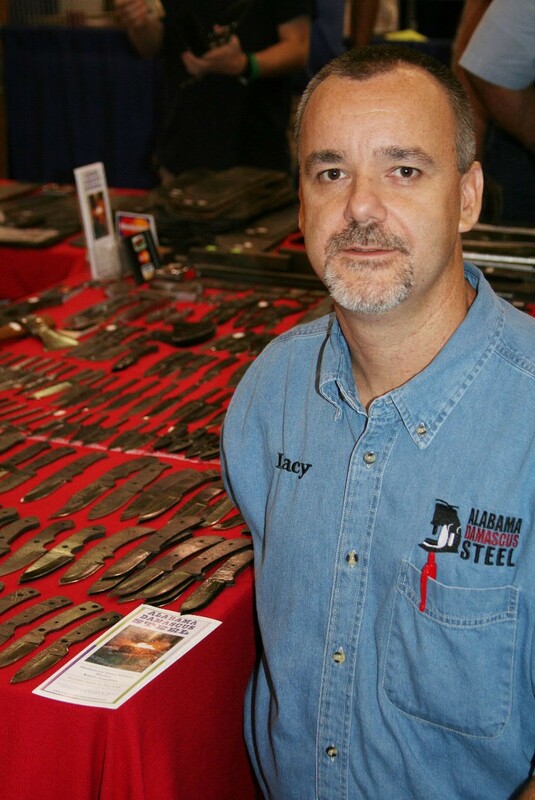 My articles on knives have also appeared in various of the Krause publications, such as Knives 2011 , and others, in addition to national and regional sporting magazines such as Knife World. I also have additional blog posts on knives and featured them in segments of my radio shows, “The Backyard Sportsman” and “Hovey’s Outdoor Adventures” which may be heard on Apple iTunes or WebTalkAmerica.net. For more information on my books, other products and nearly 400 videos go to my website http://www.hoveysmith.com. The finished grips on a good-looking, custom-fit knife of special significance to the owner.